“I am so glad you came back.” ABC has released new sneak peeks at the midseason return of Kevin (Probably) Saves the World. The comedy-drama centers on Kevin Finn (Jason Ritter), a selfish and materialistic man who must commit acts of acts of kindness to save the world. The cast also includes JoAnna Garcia Swisher, Kimberly Hébert Gregory, Chloe East, J. August Richards, Dustin Ybarra, and India de Beaufort. Season one of Kevin (Probably) Saves the World returns to ABC on January 2nd at 10 p.m. ET/PT. The Ugly Sleep”- Reveling in his success after finding the first righteous soul, Kevin attempts to help a man start dating again after a bad break-up. Meanwhile, inspired by Kevin’s good deeds, Reese befriends the new girl at school. Yvette becomes concerned by Tyler’s desperate search to reconnect with the mysterious lady he met in Laos, and Amy finally finds the courage to ask Nate out on a date, on “Kevin (Probably) Saves the World,” TUESDAY, JAN. 2 (10:00-11:00 p.m. EST), on The ABC Television Network, streaming and on demand. 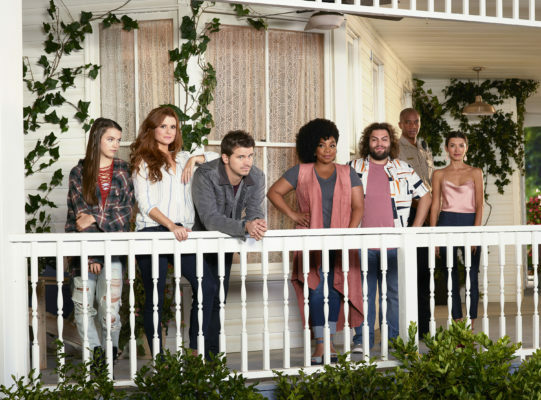 “Kevin (Probably) Saves the World” stars Jason Ritter as Kevin Finn, JoAnna Garcia Swisher as Amy Cabrera, Kimberly Hébert Gregory as Yvette, Chloe East as Reese Cabrera, J. August Richards as Deputy Nate Purcell, Dustin Ybarra as Tyler Medina and India de Beaufort as Kristin Allen. Guest starring in this episode is Trent Garrett as Charlie. “The Ugly Sleep” was written by Davah Avena and directed by J. Miller Tobin. What do you think? Are you watching Kevin (Probably) Saves the World? Would you watch a second season? More about: ABC TV shows: canceled or renewed?, Kevin (Probably) Saves the World, Kevin (Probably) Saves the World: canceled or renewed? My husband and I were excited to find a show that we look forward to. It is heartwarming, funny, quirky and different. We like the cast, and particularly Jason Ritter, who like his father John Ritter. charms us in this show. The show put some a smile on my face each week. I hope for the unexpected, that this show get a chance to continue developing. Yes, I commit to watch a new season of this delightful show. I love this show. There’s nothing else like it on TV. It’s such a breath of fresh air from what’s on a lot of the other channels. Like a summer day at the beach. Please keep it for another season. This show is my current network favorite — therefore, it’s almost sure to be cancelled. If I like a new show, it’s doomed. So much so that in years past, I’ve recorded the entire first season of new shows and not watched them until I knew a season 2 was on the way. It saved a lot of heartbreak. Now I love this show, and ABC is almost sure to kill it. Hey ABC, this and Designated Survivor are the only shows I watch on your network. Please don’t kill them. I love this show. anytime there’s a wholesome show on it seems like they want to take it off the air. Please don’t take this one away from us! I love this show!! I will definitely be watching on Tuesday night! I hope it gets renewed. Excited to see K(P)STW returning midseason! GREAT SHOW! ONE OF the top 5 shows I look forward to each week. A family favorite. Crossing our fingers that it’s renewed for a 2nd season! I am thrilled that ABC is bringing Kevin back. I’m in love with this show and Jadon Ritter is a stellar actor and deserves to have this chance on a truly enjoyable show. Entertaining quirky show. The apple didn’t fall far from the tree in comparing Jason with Dad, John, both very talented & likeable. I say renew the show & promote it more. My wife and I have watched every episode, even when hearing it might be cancelled. Excellent show, so glad ABC is continuing the story. Yay! So glad this is coming back; I love it! Refreshing change from all the reality garbage that’s on.